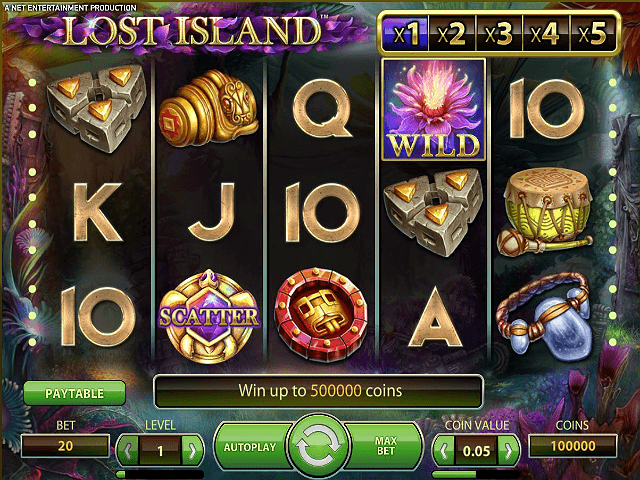 A strange, deserted island and exotic hidden treasure are the hallmarks of Lost Island, an intriguing and easily accessible slot from the ever-inventive boffins at NetEnt. An enjoyable multiplier feature and an enticing free spins round help put this slick five-reel, 20-payline offering on the gaming map. Remember now, ‘X’ marks the spot. Play Lost Island for Real Money! Essentially, the story behind the Lost Island slot game is a slightly ambiguous re-telling of the Atlantis myth. A remote island that was once home to a thriving population is now deserted; everyone has got in their boats and disappeared. Why? Nobody knows. What we do know though is that they’ve been silly enough to leave treasures and precious artefacts behind, so now it’s your job to spin the reels and see what you can discover. Along with its engaging back story, Lost Island boasts wonderful graphics and a hauntingly good soundtrack. The crystal-clear lagoon and underwater plants do a marvellous job of generating a suitably mysterious vibe and the colours within the game are so vivid they seem to pop out of the screen. You can get involved for as little as 20p or invest as much as £100 per spin if you like. It’s a nice betting range really, as it means novice players and experienced punters alike will find a level they’re comfortable gambling at. 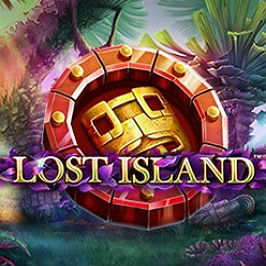 The five main symbols used in the Lost Island slot game are valuable-looking curiosities which can best be described as: a blue gem necklace, green drum, triangular stone, round mask, and a golden artefact. The standard 10, J, Q, K and A emblems fill in the lower value spots. The game’s wild is a glowing purple lotus flower which stands in for everything other than scatters. The scatter symbol — a golden turtle amulet with a multi-coloured gem in the middle — activates the game’s free spins feature. Land three scatters on the reels and you’ll be rewarded with at least ten free spins. Land four and you’ll get 20 free spins. Manage five and 30 free spins will be all yours. The real beauty of this round is that you can also trigger more free scatters during your free spins if you get three or more scatters while you’re playing. The fact that the Wild Multiplier remains in place during this round is a big plus, too. 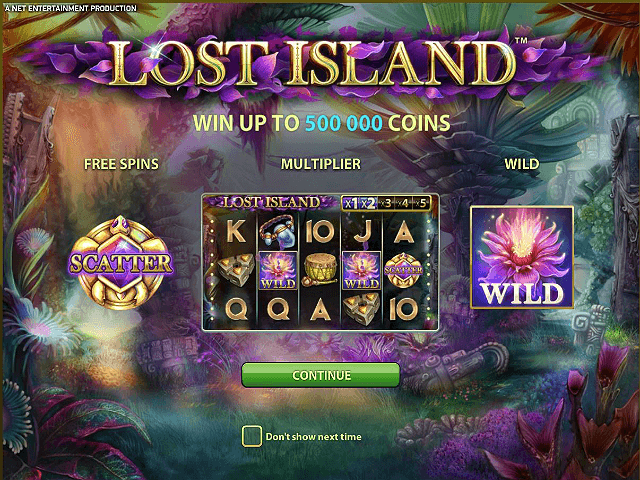 The Wild Multiplier is the Lost Island online slot’s main feature. How the multiplier increases is dependent on the amount of wilds you land on the reels, i.e. the multiplier will go up by one, to a maximum of 5x, for each wild you get. It’s worth noting that the wild doesn’t have to be part of a winning combination; it just has to be visible on the reels. A handy little 1-5x chart in the top right-hand corner of the screen shows where you’re at with your multipliers. 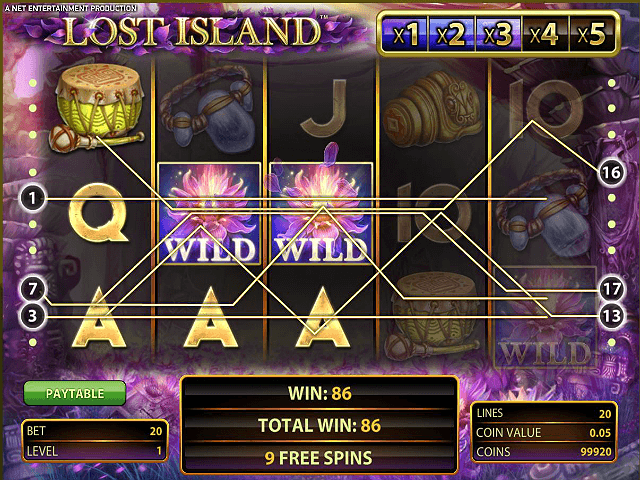 Great visuals, an eerie (yet incredibly relaxing) soundtrack and straightforward, intuitive gameplay make the Lost Island slot machine a treasure worth seeking out. The fun bonus rounds will more than likely keep you coming back for more, too. Share this Lost Island Review today! 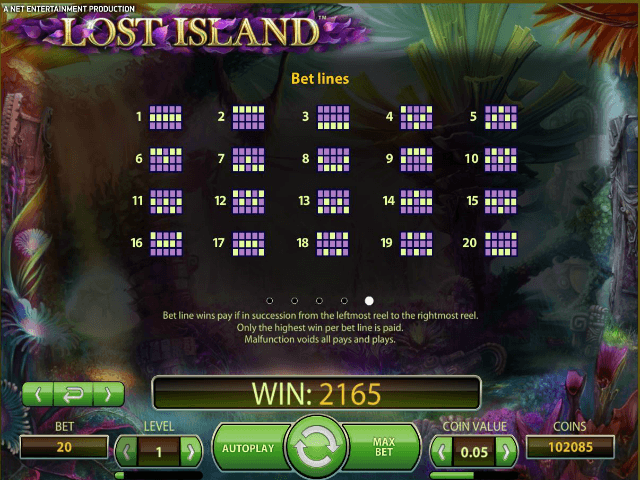 If you like Lost Island, you'll love these slot titles too!